Disclaimers aside, here’s what caught our eye at this year’s summit. 1. You too can use AI like Google, Facebook, and Amazon. Jane Zavalishina, CEO at Yandex Data Factory, said the biggest AI misconception is that it’s this futuristic thing. It’s not. And it’s not just for tech giants either. The same machine learning software helping you find, watch, and buy what you want online can now be put to use in other contexts, such as analyzing raw factory data to dial in industrial processes and save costs. 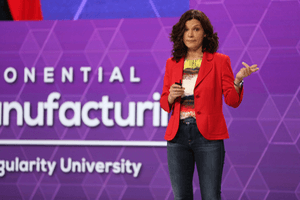 Jane Zavalishina, CEO at Yandex Data Factory, at Exponential Manufacturing. Zavalishina said machine learning software like this is available now and, sometimes, even free. “These systems have been really useful for quite a while. And what’s changed is, in 2017, the technology is now so available that you don’t have to have super-skilled people using it,” said Neil Jacobstein, faculty chair of Artificial Intelligence and Robotics at Singularity University. 2. Robots are now smart enough to avoid killing you. Robots are old hat in manufacturing, but they’ve always needed tightly controlled environments to work and PhDs to program. Robotics legend Rodney Brooks demoed Rethink Robotics’ Sawyer robot live onstage to show it can be programmed by anyone. And thanks to cheap 3D modeling hardware and better software, robots are also getting smart, lightweight, and aware enough to work next to humans without accidentally hurting them. The next step isn’t the end of human workers, it’s a collaboration that combines the best of robots and the best of humans. 3. 3D printing is gearing up to take on mass manufacturing. The dream of 3D printing has always been to make anything, anywhere, anytime. But the challenges have been cost, quality, and speed. With emerging solutions from Carbon and others, 3D printing finally appears poised to take on mass manufacturing. In areas where 3D printed final parts are possible, assembly lines will be dematerialized. That is, we’ll go directly from design to part, without the need to retool and rebuild infrastructure for every new product. 4. Augmented reality will transform how we design and build. Lots of people have heard of or tried virtual reality by now. There are commercial devices on the market and plenty of speculation about when it’ll achieve mainstream adoption. Right behind virtual reality is augmented reality. Whereas virtual reality is completely immersive, augmented reality lays the digital world right on top of the real world. It’s a more complicated engineering problem, but it also has more applications. In a world of advanced AR, we’ll use a small wearable device to interface with computers like Tony Stark in Iron Man. In manufacturing, this means designers ditching 2D modeling programs to do their work more quickly and intuitively in 3D spaces hovering over their desk. It means workers on the factory floor getting real-time big data insights about machines and processes laid out in front of their eyes or hands-free, step-by-step instructions guiding them to repair and build things. 5. We’re reprogramming biology to make industrial stuff. 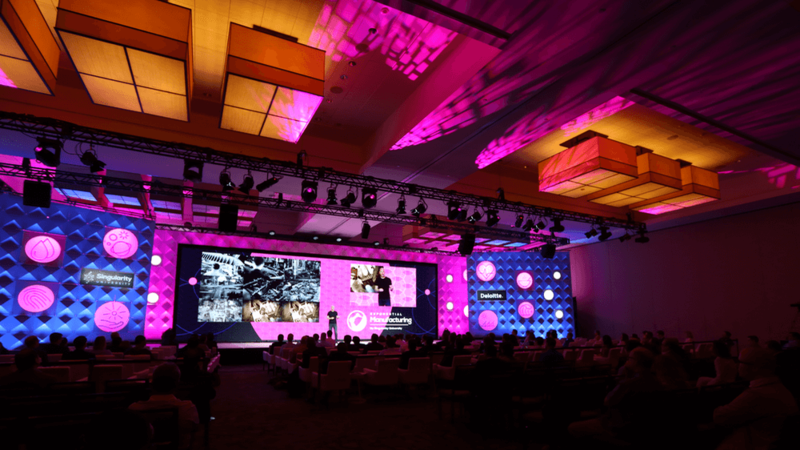 A bit further down the road, biomanufacturing will be a big deal, according to Raymond McCauley, chair of Digital Biology and Singularity University. And we’ve seen progress. McCauley noted gene-tweaked algae making biofuels and modified bacteria spinning spider silk. But, he said, while the tools to make biomanufacturing a reality are getting cheaper and more powerful every year, scaling up is still a big challenge. 6. To survive change, innovate on the edge more…a lot more. Technology is clearly moving fast. So how do you keep the pace? Old companies on the S&P 500 once had 50- or 60-year lifespans. These days that number is more like 20. Small software startups can disrupt giants of industry. Innovation is no longer that thing you do on the side, it’s a critical and increasingly central survival skill. Geoff Tuff, leader of digital transformation at Monitor Deloitte, and his team came up with the “golden ratio for innovation” five years ago. Their advice? Spend 70% of your innovation resources on the core, 20% on areas adjacent to the core, and 10% on the transformational space. This wasn’t supposed to be a rule set in stone, but rather a way to start the conversation: How much and where do we innovate? The short answer today: More and outside your comfort zone. Tuff thinks his ratio is likely already outdated. 7. The pace is accelerating. Can we keep up? The tone of the conference was hopeful and excited, but the implications, some of them worrying, were also discussed. The pace of technology-fueled job creation and destruction was foremost of these. 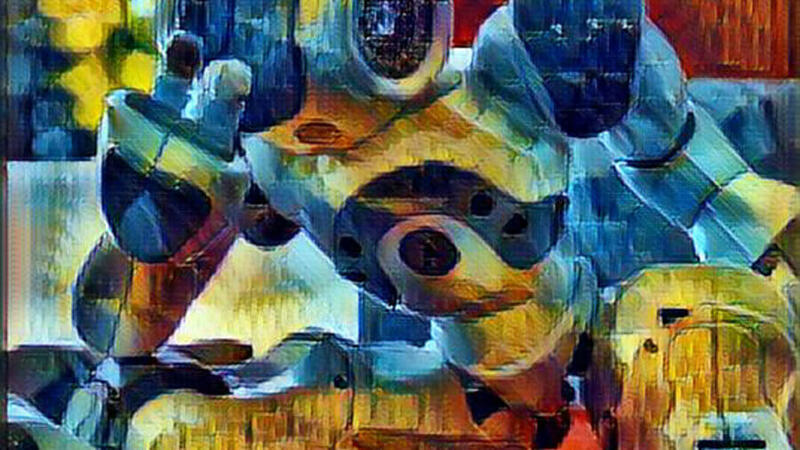 Advanced AI and robotics promise widespread automation. Historically, automation has done away with old less satisfactory jobs in favor of, on the whole, better ones. But transitioning from one skill set to another isn’t simple and can be too easily glossed over. In the past, such transitions have been very bumpy. And that’s the problem keeping Singularity University co-founder and chairman, Peter Diamandis, up at night. He worries the time it takes to make the transition won’t match the rate of change. It’ll all happen too fast. “In 1810, the United States had 84% farmers. Today it’s 2%. A huge change in our job markets. But that was over a long period of time,” Diamandis said. What if we lose “huge swathes” of jobs over a 20-year period instead? We’ll see social and political unrest on a grand scale. Diamandis said universal basic income may be a way to help ease the transition. And while we can’t shrink from the coming challenges, neither can we let them blind us to the hugely positive and beneficial change being wrought alongside. “The son or daughter of a billionaire in New York or the son or daughter of the poorest farmer in Kenya is going to have access to the same level of education delivered by an AI, the same level of healthcare delivered by an AI, or intervention delivered by a robot. So, we’re going to start to demonetize all the things we think of as the higher stakes of living,” he said.